Fund the best and the brightest at the Hebrew University of Jerusalem. By establishing an AFHU Hebrew University Gift Annuity, you receive a high lifetime return, tax deductions, and annuity payments that are substantially tax-free. Equally important, your annuity supports the Hebrew University of Jerusalem, enabling the university to conduct pioneering research and meet global challenges in future years. Your generosity cultivates prosperity. A gift from your estate will help propel cutting-edge medical research, spur innovation in technology, and create a more sustainable world for generations to come. These planned gifts can also achieve effective estate and tax planning for philanthropic individuals. For more information on all planned giving opportunities, please use the form below or contact us via email. Hebrew University is synonymous with innovation. From the frontier of nanomedicine to reinventing agriculture for our changing planet – some of today’s most prolific leaders in technology, humanities, and the sciences are here, mentoring the next generation’s inventors, policy makers, health practitioners, and scholars. Your gift to Hebrew University is an investment in our students, our faculty, and our shared future. You can learn more about some of our foundation partners here. For those who seek a higher purpose in everything they do, AFHU missions offer travelers a heightened connection to the Hebrew University and to Israel. 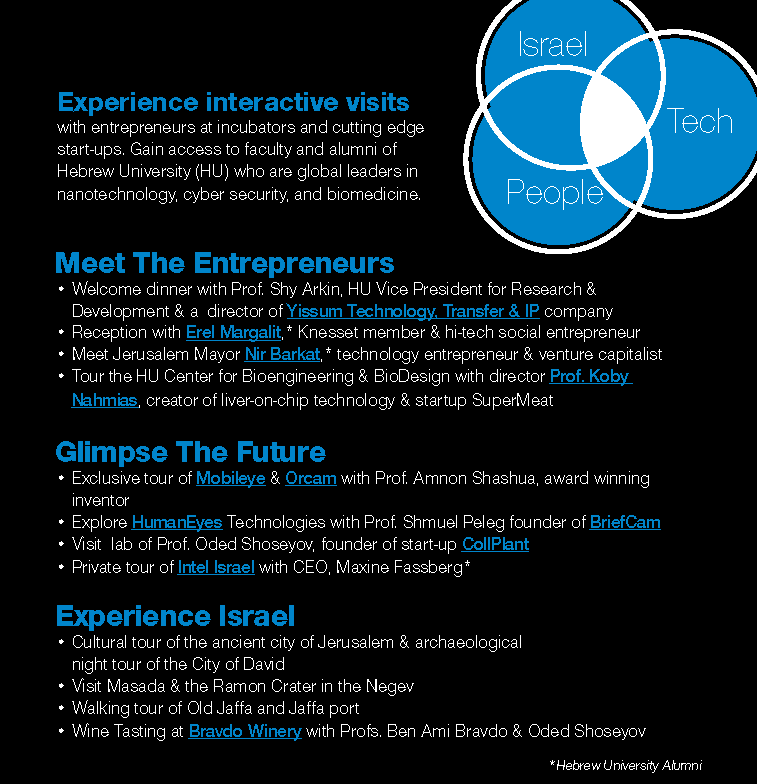 The experience is a curated journey that includes VIP events, receptions, and briefings with several of Israel’s top academic and research talents. Click on any of the mission types below for a sample itinerary. Visit our campus. Meet our people. Reading about the Hebrew University of Jerusalem is great. Visiting the university is unforgettable. Past experiences have included group tours, private tours, meet and greets with outstanding faculty and students. Contact your local AFHU office to get started. Bring a little buzz to your cocktail social with a guest speaker from the Hebrew University. Whether you’re interested in nanomedicine or sustainable agriculture, our team can help create a night to remember for you and your guests.